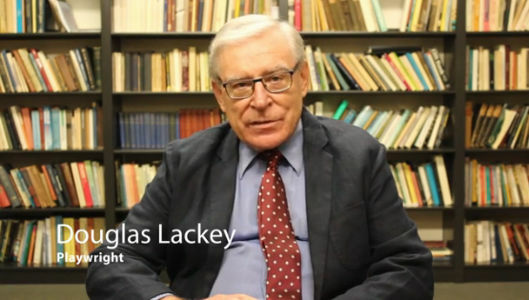 Playwright Douglas Lackey has two lives, as a playwright and a philosophy professor. 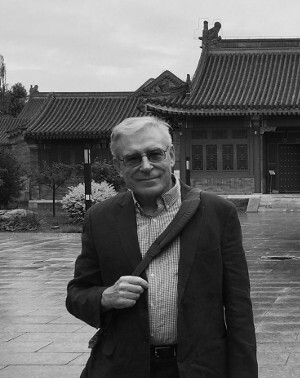 He is a Professor of Philosophy at Baruch College, CUNY, where he has taught since 1972. But he has a 14 year relationship with the Theater for the New City, which has presented all his plays to date. His first play presented there, "Kaddish in East Jerusalem" (2003), dealt with issues of the Second Intifata.. His "Daylight Precision" (2014) was a historical drama examining "just war" theories through an unsung hero of World War II, Gen. Haywood Hansell. His last play was "A Garroting in Toulouse" (2016), set in the Thirty Years War, which dramatized the differences, still with us, between the Protestant sense of sin and the Catholic sense of redemption. What is "Arendt/Heidegger: A Love Story" about? Is Heidegger's "Being and Time" a Nazi book? WHAT IS THIS PLAY ABOUT? Hannah Arendt was a brilliant political theorist and a philosophical thinker of the first rank. As a teenager, she commenced an affair with Martin Heidegger, a celebrated German philosopher who went on to become a leading and unapologetic supporter of Adolf Hitler. After World War II, Arendt maintained her friendship with Heidegger, met with him and corresponded with him, despite Heidegger’s silent refusal to disavow the Nazi party. How could this have happened? How could perhaps the most brilliant woman of the twentieth century maintain a life-long relationship with a duplicitous Nazi? Previous studies of the relationship all consider it a colossal failure of judgment on Arendt’s part from first to last. "Arendt/Heidegger" probes more deeply into the Arendt/Heidegger affair by presenting sides of Heidegger as Arendt saw them: the charismatic teacher, the intriguing student of the human condition, the lover of art and poetry. Arendt connected with Heidegger, physically, emotionally, intellectually. This is a story of a woman in love, no ordinary woman, and no ordinary affair. I am a philosophy professor by trade, and philosophy professors don’t usually write plays. Of course, there was Sartre, and there was Camus. But that was another century, and that was France. Things are different in France! There are 10,000 philosophy professors in North America, but I seem to be one of the few writing plays on a regular basis. So why do it? One reason was that I was increasingly unhappy with the plays I was seeing, and I saw many, living in New York. There seemed to be one theme: The Relationship. Here are some ordinary couples: will they ever be happy? Or will they be remain miserable, with their petty, self-inflicted problems? The people were small scale, the problems standard, and the intellectual content zero. Those were the years when Seinfeld, the "show about nothing" dominated all of TV. Then came the Second Intifada, starting in 2000. There were two sides; the problems were deep, perhaps intractable. It wasn’t just Israelis versus Palestinians: it was a conflict of identities, Judaism versus Islam, a national faith versus a universalist creed. So I wrote a play about that, "Kaddish in East Jerusalem." Good or bad (I leave that to the audience) at least it was a play about something. Ideas can be exciting, and deep philosophical problems can be dramatic. Call this The Theater of Ideas, if you like. I moved on. My next play, "Daylight Precision" took on the Army Air Force and World War II. To win the war, you must bomb the enemy, but if you bomb the enemy, you kill thousands of children. That is not nothing. After that, came "A Garotting in Toulouse," set in the Thirty Years War, dramatizing the differences, still with us, between the Protestant sense of sin and the Catholic sense of redemption. Now comes "Arendt/Heidegger: A Love Story," about passion and friendship and the oddest couple in the history of odd couples. Here we have the budding Zionist on the one side, and the unrepentant Nazi on the other. What could they have possibly said to each other? Did the philosophy Heidegger developed before Arendt’s eyes in the classroom in the 1920’s lead straight on to Auschwitz in the 1940’s? Was the Nazi episode an aberration, or was it a deep expression of Heidegger’s nature? To get the answer, you must get both the man and the philosophy, and to get that, you should see the play. Can Heidegger’s existential phenomenology be made dramatic? The Theater of Ideas says yes. IS HEIDEGGER’S "BEING AND TIME" A NAZI BOOK? The play, "Arendt/Heidegger" shows Heidegger at three stages of his career: first, when he was writing "Being and Time," (1927) one of the most famous philosophy books of the twentieth century; second, when he joined the Nazi party and gave public speeches praising Hitler (1933), and third, after 1945, when he remained silent and did not repudiate the Nazis. Many people have wondered about the connection between stage one and stage two. Does "Being and Time" lead to Nazism? If it does, then "Being and Time" joins Hitler’s "Mein Kampf" as one of the worst books of the twentieth century. Many scholars have argued that "Being and Time" derides science and rationality, and this leads into the dark irrationality of Nazism. Does this explain how Heidegger the philosopher became Heidegger the Nazi? If we look at philosophical ideas outside Germany the 1930s, we find that rationality was also under attack. The prevailing school of thought in England, the U.S. and Austria was "logical positivism." The positivists maintained that rationality exists only in science. For positivists, there is no such thing as a rational politics or a rational ethics. Yet all the prominent positivists, especially the Austrians, were public opponents of Hitler. Apparently, not all anti-rationalists become Nazis. So the problem cannot be solved by denouncing Heidegger as an "anti-rationalist." We must dig deeper and ask, what is the essence of Nazism? And what is the essence of "Being and Time?" The distinctive doctrine of Nazism is the division of mankind into competing races, with some races marked out as superior and others, the Jews, most of all, marked out as inferior. If we turn to "Being and Time," we find nothing about races and racial competition. We find, instead, an account of the human condition and a problem faced by all human beings, the inevitability of death. What is the "irrationality" that people locate in "Being and Time"? The irrationality stems from Heidegger’s rejection of a very old philosophical doctrine, called "representationalism." That is the idea that the most important thing about me is that I have a mind and that my mind makes pictures of the world. For Heidegger, representationalism puts the mind outside of the world, looking over at it. However, the truth is that we live immersed in the world and cannot get outside of it, not even in thought, and not even in science.